President Obama says there's no "sugarcoating" the problems with HealthCare.gov, and added that tech industry experts were being brought in to help workers to resolve the website issues. Anne Filipic of Enroll America, an organization that promotes Obamacare insurance sign ups, and Rep. Andy Harris (R-MD), who is also a medical doctor, join Newt Gingrich and Stephanie Cutter in the Crossfire to discuss who's to blame and what should be done. What do you think? 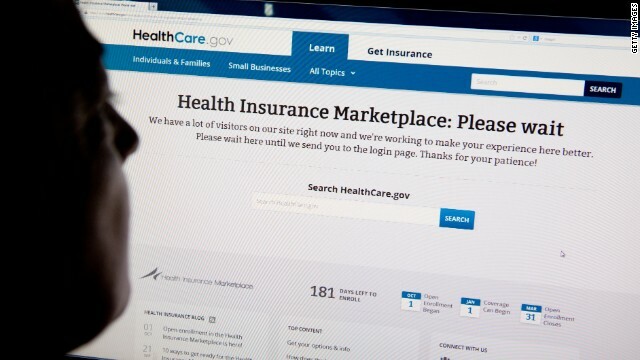 Should the requirement to purchase health insurance be delayed due to the Obamacare website failures? What is it with these MD's becoming politicians? Guess they can make more trading favors than curing the sick. "American women participated in the nation’s labor force in September at a rate that matched the lowest level in 24 years, according to data released today by the Bureau of Labor Statistics". The young woman who almost fainted during President Obama's speech is Type 1 Diabetic and is 20 weeks pregnant. Various medical explanations would exist that would explain her displaying such symptoms. Obama is the most radical, destructive and worst President in history. He is arrogant, a pot head, lazy (maybe works 10am to 4pm) incompetent, lawless, a fraud, never had a real job, aloof and a COMMUNIST. Obama and the Democrat party are continuing to destroy the great US economy. In almost five years they have; deficit spent $7 trillion (most of any Pres.) with nothing to show for it, increased national debt to $17 trillion and counting, real unemployment rate of 18%, no job growth, 8.5 million lost jobs, 90 million not working, black/hispanic unemployment over 20%, they hate oil/coal industries, fossil fuels, military, private sector, success, constitution, right to bear arms, over 2,260 soldiers killed in Iraq/Afgn since Obama became Pres., one in five people in poverty (highest ever), pushed Obamacare that was not wanted by majority of people and has already increased insurance rates 50%, is largest tax increase in history, will further destroy jobs and the economy and now costs $3 trillion, wasted billions of taxpayer funds on scam clean energy deals like Solyndra and Ener1 to campaign donors, foreign policy of cowardice and appeasement that has allowed at least two terrorist attacks, Benghazi and Boston, supports worst Ex Sec. of State in history, Hillary Clinton, who is responsible for the murder of Libyan ambassador and three staffers in Benghazi, supports worst AG in history Eric Holder, who is responsible for killing a border agent and the AP scandal, 48 million on food stamps and increased business killing govt regulation/employment more than any other Pres. Obama should be IMPEACHED. Its the law. Figure out a way to get compliant or pay your penalty. You can kick and scream all the way to the mailbox...but its law. So deal with it. Vince, I believe that an employer mandate was also in the law. I also do not remember union and bundler carve-outs. No problem taking care of them. Does Obama have Obama care for himself?? and his Family?? or his Union Buddies? 30 million uninsured. $300 million just for the website. I am not great at math, but couldn't that money have been given to the 30 million uninsured at $10 million per person? I bet you could buy a pretty good health insurance plan for that. It's funny how many people want to blame someone rather than step back from this and understand that the Consitutional underpinnings for this malodorous deal between devils of the insurance companies, the Hospitals, AARP, Drug Companies, and the Dems, runs foul of the Constitution, and forcing the States to do things with a power the Federal Government does not have. States not playing along? Yep, they have that power, so if you want to be a despot and shove it down peoples throats because you are too damned in a hurry to pass a poor law while you have a super-majority,...well, this is what you get. Great work Mr. President. Too bad the fawning media can't cover this mess up for you. If one takes the position the ACA is law, then it must be followed exactly as it was passed with no special exemptions, deferrals or exceptions for businesses, insurance companies, unions or members of Congress. If the law cannot be applied fairly to all at the same time, it should be delayed until such time as all sectors can comply........there shouldn't be winners and losers. The promotion of a program that places citizens personal information at risk because of lack of security is unconscionable. Any rational person should realize the ACA has not been implemented properly and that the program should be delayed until a competent and safe delivery system can be developed. As an aside, Stephanie Cutter's dialogue with Congressman Harris was most disappointing. Rather than debate with facts, she came across as an administration partisan defending what obviously is an inept and failed delivery of a federal program. Perhaps she needs to be reminded that she no longer works for the White House. Her attempted badgering of Harris came across as sophomoric and unprofessional, with no verifiable facts to counter his statements. If I want to hear unsubstantiated spin, I'll tune in to a Jay Carney press interview. The law should not be changed for anyone! Part of the law should have never been changed. Small business should not be getting a year extension. They were mandated to follow the law in 2010 when it was declared constitutional in 2010. They have had just as much time as everyone else to get it together. The Supreme Court didn't change the law! 1. The government could have saved millions of dollars if they would have just lifted the "Ban" on pre-existing conditions.That law was unconstitutional and should have never even been into effective. 2. A law could have been made to require everyone to buy insurance and mandate that all business provide insurance to all of his or her employees, regardless to the number of employees. 3. Laws could have been made to regulate the insurance industry. Instead we have a massive online website, that's costing millions in the end if you count all the free health care, the subsidies ect. that are being handed out along with it. It's an unfair system. It's set up just like the entitlement programs. People who are in the middle get no assistance at all. We are paying ridiculously high prices, with no assistance. The program should be designed for everyone but if you have insurance at your company that you are working for, you cannot apply into these new exchanges. The law should have been changed back to where everyone abides by the law at the same time and everyone needs to just figure it out how to pay for it all, with out running up more debts in our government. We all buy car insurance, home owner insurance, flood insurance, renters insurance ect.. no one gets any government assistance. Hey, guess what? Here in Connecticut where our state government actually made the smart decision and implemented the exchanges themselves, we haven't had any major problems. The problems are happening in the states that refused to cooperate with the federal government and the federal government had to step in and do it themselves. Seems to me, they are just looking for a reason to make a fuss. First of all I am an RN – a licensed college educated medical professional that just retired after 30+ years. My last 10 years I spent working as a nationally certified Diabetes Educator. Please note I have 100% health care benefit coverage as part of my retirement package, so I have no vested financial interest in ACA. My husband was a CA state EMS commissioner for 10 plus years, plus being CEO of his own medical company, and was very involved in EMS at city/county level. Our son is medical physician, but also has own company where he does electrical engineering. Good quality medicine is a very important part of our family. I have closely researched, read law, visited HHS website frequently and closely observed and analyzed as all has unraveled re: ACA. Available info on HHS website re: ACA is excellent. I have watched closely as the enrollment opened on Oct 1, and the continued computer problems people experienced. I worked for a large health care provider organization, and have worked through same/similar computer problems during new computerization system start up. As a medical management professional, I do not see any need at all, nor any medical management decision which would rightly justify any delay of the enrollment process for ACA at this time. Several alternative options are still available. Enrollment will continue on, even with problems at present. And some of best high tech specialists are on board to correct the various computer related problems. Staffing at various call centers has increased. We are only three weeks in now, and think we all need to take a deep breath and let HHS contractors, other high tech specialists correct the computer problems. I worked through our computer problems, saw my patients, dealt with all the frozen computer issues, all the computer programming glitches, put in alot of long unpaid hours, etc.. All continued to improve as time passed , and I ended up loving the system. The many positives present in a computerized system definitely improves quality of patient medical care. Rep Andy Harris hit the nail on the head tonight. He said employers have to figure out how many people they can AFFORD to pay insurance for. This is an excellent reason to take health insurance out of the hands of the employers, so more jobs can be created. National health insurance is the best plan, just like many other countries do successfully. It was never going to work. Just another Medicare program in the making. Doomed to fail as a government mandated law that will eventually tax the working class into poverty and the lazy takers will continue taking. Not everyone deserves insurance. Those that worked for it should get it… Just as Medicare was designed. Close the book on this one. It should be deemed illegal. Typical Tea Party/GOP talking point rhetoric that started immediately upon passage of a national health care program, before they been knew anything about it. TA computer glitch has absolutely nothing to do with the fact that this program gives millions of people healthcare who have been costing America billions in emergency room fees, lost production hours in businesses, early deaths due to lack of healthcare, children developing lifetime problems due to lack of preventive care, etc. I am sure that some of the concerns by Republicans in regards to the Affordable Care Act may be legitimate. That being said, they could have used all the time and energy they spent on trying to de-fund it by working on ways to make it work. I guess that would using common sense which appears to be in short supply on Capitol Hill. CNN you are kidding.... You have a political discussion between factions facilitated by factions and there is ZERO evidence to ANY of the supposed facts. This is not journalism it is rhetoric and banter and is simply no different than FOX News. Can one of the management please step in and at least ask for verification of sources from both sides. I am astounded at this waste of air time. Get back to factual reporting and debate between ethical people. Frankly this is a sign of poor leadership at CNN. Was Stephanie Cutter "installed" at CNN by the obama administration or what? There is no doubt that there were many glitches when medicare, medicaid and social security began. Many people are not computer savvy and that is a problem. States are not cooperating either. There is enough blame to go around. We want instant service and that just is not going to happen. The shutdown is just one more example that shows that our people in Congress are not capable of working together. Their egos are too big and they consider anyone who has differing opinions the enemy. The biggest problem we face is the inability or our leaders to work together. They are supported by a media that loves disagreement and grandstanding. It can only be delayed if the requirement that insurers cover pre-existing conditions is also delayed. Even if a problem with website being able to purchase health insurance is better even if it takes a number of attempts to complete the online process than not having health insurance and not being able to go to the doctor or if you do go to the doctor without health insurance, having medical bills in the hundred if not thousands of dollars. Yes, you are very correct about the high costs of medical care in US. In 2000 my husbands cancer medical care over 5 months came to $1,000,000+. Per medical dollar costs today – his care would cost almost $3,000,000. As a medical professional – everyone should carry medical insurance coverage. No matter what your age is – no one has a magic genie to predict when they may need extended medical care. All the media talks about is Obamacare and talking points, yet never gives air time to the real problem it's designed to address: currently uninsureds get care at emergency rooms that ultimately gets paid for by the rest of us. The GOP approach was "status quo" but cut back services (let them die) and the Dems approach was "single payer" like Medicare. Obamacare was a compromise that keeps the money flowing through insurance companies BUT requires them to spend the money on care, not lobbying. They hate that! How about covering stories with some reality mixed in.